Welcome to the BTCJam blog! We are always thinking about ways to provide information to help you make better decisions about your investment. We will be publishing a variety of information to share what’s on our minds with you and, of course we would love to know what’s on yours! We would like to disclaim that we are not claiming to be experts on the topics discussed here, but we would like to open the channel to have relevant and, hopefully, intelligent discussions. Also, if you are an expert on the topic discussed, please help us out by enriching the conversation! That said, the topic of the day is currency risk. Even though Bitcoin is a worldwide non-centralized currency, most of us still make a living earning regular (government/central bank issued) currencies, such as dollars, euros, rupees, etc… Hence, currency risk is something that is still on our minds (we say still in hopes that this problem will be in the past soon!). 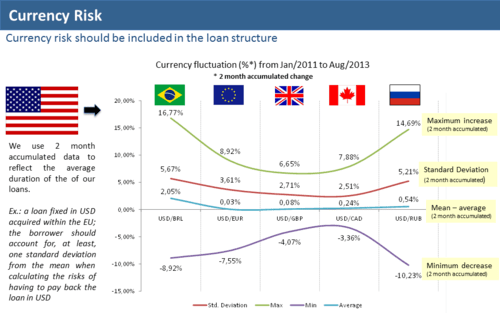 As most of you know, at BTCJam you can index your loan in USD, EUR, CAD or RUB (as of yet! ), using bitcoins as a payment method; avoiding the bitcoin currency risk and that’s when the “regular” currency risk kicks in. Meaning: if you are applying for a loan and you want to index your payment in USD dollars, and your earnings are in another currency, you must take into account the risk of exchanging one currency to another. The market uses hedging tools to avoid currency risk exposure, and we hope to offer hedging options to you very soon; however we still don’t. Hence, we believe that providing information on how currencies have been behaving could be useful. At least statistically, you can calculate the probability of your currency varying against the US dollar and incorporate that percentage into your payout offer. We created an excel sheet (download it here) with the currencies most used in our platform (BRL, EUR, GPB, CAD and RUB) and their accumulated two month variation against the US dollar (we use two months because it’s the average loan term at BTCJam). The database comes with data from the past five years (daily rates), and in the “Currencies Analysis” tab we accumulated the changes to calculate the variance, the mean, the standard deviation and the min-max changes within a two month period. Taking the average % change and the standard deviation into consideration when you are planning your payments will help you to account for the historical risk your currency have against the US Dollar. Please note that we are not dealing with futures market, it’s just historical data. We hope this information is useful and we would love to hear your thoughts and questions. We are going to change the world, one bitcoin loan at a time!